Continue reading for a look at some of the most notable statistics heading into the Spirit’s last away game of the season. Washington put four goals across in each of its first two match-ups with Sky Blue this season, first in a 4-3 win on May 6 and again in a 4-1 road win on August 4. Havana Solaun found the net in each of the first two meetings, while Francisca Ordega (2 goals, 1 assist) and Arielle Ship (1 goal, 2 assists) earned NWSL Player of the Week honors following their breakout performances against Sky Blue in Week 4 and Week 15, respectively. Huster has carried her positive momentum from August into September by leading the team in total passes each of the last three games, connecting with her teammates 142 times over the course of match-ups with Chicago (Aug. 26 | 54 passes), North Carolina (Aug. 30 | 46 passes) and Portland (Sept. 2 | 42 passes). Despite battling through a recent injury which kept her out of the lineup for three games, Zadorsky remains one of the top 15 league leaders in clearances and continues to lead the Spirit in the category. Through the team’s first 21 games, Sky Blue FC has posted an NWSL-best 54.7 percent shooting accuracy. The New Jersey side has placed 123 of its 225 total shots on frame. Limiting Sky Blue’s scoring chances will be key for the Spirit as they go up against a team tied for the most on-target shots in the league, in addition to being the most accurate by percentage. 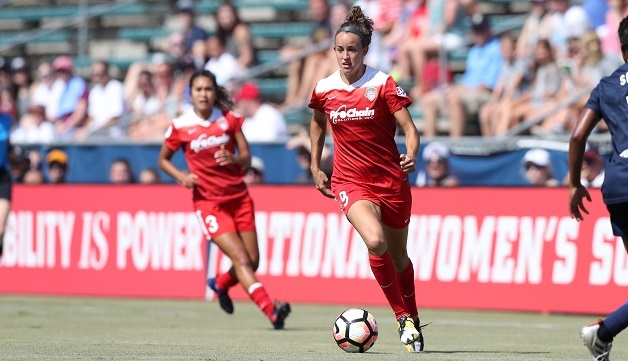 Kerr, the NWSL’s leading scorer with 16 goals on the season, has found the net against eight of the nine opposing clubs in 2017, with Washington being the only remaining side to not concede to the Australian international forward. She was held scoreless in her only appearance against Washington back on May 6.